And I’m back to my usual tricks. I THOUGHT of starting this earlier. But no. I made the starter on Sunday and we baked the rolls last night. Here I am posting – JUST under the wire!! The Kaiser roll, also called a Vienna roll or a hard roll (original name: Semmel or Kaisersemmel; if made by hand also: Handsemmel), is a kind of bread roll, supposedly invented in Vienna, and thought to have been named to honor Emperor Franz Joseph. It is a typically crusty round roll made from flour, barm, malt, water and salt, with the top side usually divided in a rotationally symmetric pattern of five segments, separated by curved superficial cuts radiating from the centre outwards. 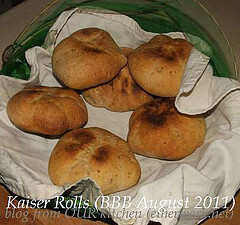 Kaiser rolls are often produced by machine, as well as by hand. In Vienna leaven is never used for making the rolls and small goods for which that city is famous. Viennese bakers use either brewers’ yeast or a ferment, prepared by themselves, of which the basis is an infusion of hops. We don’t have hops growing in our garden!!! I don’t remember seeing hops at the weekly farmers’ market!!!! But then I calmed myself and remembered to use my little-used reading skills to see that thank goodness, the recipe Astrid showed us calls for ordinary yeast. And suddenly it sounded like fun. I LOVE Kaiser rolls! And I’ve never made them before so was very excited to do so! I announced that I was going to make the starter and then we’d bake the rolls on Sunday evening. There was the gentle reminder that we were dining at friends’ house on Sunday night. Ooops!! After having a computer alarm pop up several times over the course of the day AND walking past strategically placed little paper notes to myself to make the starter, I suddenly realized that we were leaving in half an hour. Luckily, I’d already done a few calculations. This month’s BBB recipe is one of Peter Reinhart’s. I have a deep seated, unreasonable prejudice against the man and his recipes. I don’t really know why. It can’t really be because he calls for oiling the rising bowl for French bread. That would be petty. But one thing I’d noticed was that the starter for this particular recipe makes about 454gm (1 lb) but he only calls for 368gms. Being the freak I am, I worked out that I should make 81% of the starter to get the amount called for in the actual bread recipe. Unsurprisingly, Reinhart calls for bread flour. I know he loves to use bread flour. I was thinking about using only all purpose but then I remembered that we HAVE high gluten flour in the freezer so I might as well use it. So I mixed 115 gm unbleached all purpose flour, 3 gm vital wheat gluten, 112 gm whole wheat flour (hey!!! Reinhart didn’t call for whole wheat flour! And certainly, traditional “Vienna Bread” is supposed to be all white flour bread!! ), 150 gm lukewarm water (81% of the starter recipe is 138 to 162 gms), 4 gm salt and .4 gm active dry yeast – about an eighth of a teaspoon (hey!!! 81% of the starter recipe is 1 gm of instant yeast!!). In no time, the starter was mixed and hand kneaded. Hmmmm. The starter is looking just a bit too active. Into the fridge it goes!! Good thing I put the starter into the fridge. It rose again nicely in the cold. Now that I’d already started fooling around with Reinhart’s ingredients list, I decided I might as well continue. I added 10 gm ground up flax seed and decided to omit the sugar entirely. The dough was lovely and soft. Kneading was a dream. I cut the dough in two and made a boule out of half the dough and then cut the other half into 6 pieces for Kaiser Rolls. Shaping was fun!! But will the little Kaiser buns get large enough to satisfy The Man’s sensibilities? Oh oh. There were visible muscle ticks when T looked at the just-shaped rolls…. As usual, I skipped the misting part (okay, I’ll tell the truth; I didn’t even notice that section until MUCH later – after I’d already left the rolls and boule to rise) and simply covered the just-shaped bread with a clean tea towel followed by a loosely draped plastic grocery bag on top. Happily, the rolls had doubled in size and were decreed large enough. The boule had also doubled and was looking particularly good. I was brave and slashed a design in the boule. We fired up the barbecue and after some discussion decided to bake both the bread and the rolls at the same time, putting the rolls on the stone and the bread on a pan. It didn’t seem like a mistake at first. The loaf and the rolls puffed beautifully. I can’t remember seeing such oven spring! Too bad I didn’t take a picture. Because naturally, I have no proof. You’ll just have to take my word for it. The rolls puffed so much that they lost their definition. I DID shape them like Kaiser rolls. I DID!! Of course, the rolls were done first and because there is a tendency for the bread to get done on the bottom, T turned all of them over. Including the boule. I watched as the boule slowly but surely deflated. He: What!? It’s fine… ohhhh… sorry!! We left the poor thing, now a disc, in the barbecue to continue baking and went inside to toss salad and fry ham for making sandwiches out of the Kaiser rolls. Naturally, in spite of my errors and fast and loose attitude towards what “Vienna Bread” means, you’ll want to make this bread too. But may I recommend that you learn from my mistakes and make Kaiser rolls only? Starter: The evening before making the rolls: In a medium sized bowl, whisk yeast into the water. Add the rest of the ingredients and stir together with a wooden spoon. Knead (no need to add more flour) the dough in the bowl for about 5 minutes until the dough is smooth and the sides of the bowl are clean looking. Cover the bowl with a lid or a plate and leave on the counter (or in the fridge if your kitchen is particularly warm) overnight to double. Bread: The next morning on the day you’ll be making the rolls: An hour before beginning to mix the actual dough, remove the starter from the fridge to bring it up to room temperature. In a largish bowl, whisk yeast into the water. Add the rest of the ingredients and stir together with a wooden spoon until roughly mixed and the dough comes away cleanly from the sides of the bowl. Kneading: Plop the dough onto an unfloured board and leave to rest as you wash and dry the mixing bowl. Once the bowl is clean and dry, knead the dough for about 10 minutes until the dough is smooth and silky. Put it into the clean bowl with a plate or lid overtop and leave on the counter (out of drafts, please) to rise to about double. If it doubles before you’re ready to shape, just gently deflate it by reaching down the sides of the bowl to the bottom and folding the bottom of the dough onto the top. Shaping: Put the dough onto a lightly floured board. Cut it in half and set one half to the side. 1.) Yeast and Water: Reinhart calls for instant yeast. There’s nothing wrong with instant yeast; we just don’t happen to have any on hand. I used active dry instead. And a LOT less than Reinhart suggested. N.B. Under no circumstances do I ever use water from the hot water tap. Water from the hot water tap sits festering in the hot water tank, leaching copper, lead, zinc, solder, etc. etc from the tank walls… the higher temperature causes faster corrosion. Of course, saying that it is unsafe to use water from the hot water tap might be an urban myth, but why tempt fate? I heat the water in our kettle. 2.) Flour: Reinhart calls for unbleached bread flour. It has been over a year since we’ve been able to get unbleached bread flour easily. So I used Susan’s (Wild Yeast) formula for substitution: 3% high-gluten flour + 97% unbleached all purpose (or 97% whole wheat….) Ooops!!! I slipped when measuring and put 9gm high-gluten flour into the starter rather than 3gm. 3.) Flax seed: This is entirely optional. I just wanted to add it…. 4.) Sugar: With so much malt powder added, I made an executive decision to omit the sugar entirely. 5.) Egg: I wish I’d omitted the egg as well. For me, the bread was too soft. Not Kaiser rollish at all. 6.) Shaping and Proofing: In spite of my really rotten description, it’s really really quite easy to shape the Kaiser rolls. Please see technoboulange.com/le-pain-empereur as well as Astrid’s post Vienna Bread & Kaiser Rolls for a very clear description and photos on how to do the shaping. Astrid writes: Be careful not to overproof them, otherwise they won’t hold their shape either… Of course, she’s right! I allowed the rolls to rise too far and they lost their definition almost entirely. 8.) But I LIKE warm bread right out of the oven: If you wish to serve warm rolls, reheat them after they have cooled completely. To reheat uncut rolls, put them on the top shelf of the hot barbecue for a few minutes. OR… turn the oven to 500F for 5 minutes or so. Turn the oven OFF. Put the rolls in the hot oven for ten minutes. The rolls were delicious!! We had them still warm with Black Forest ham fried in butter and on the side a big salad of romaine, yellow pepper, tomato, basil and chives with blue cheese dressing. Thank you, Astrid, for a most wonderful dinner! T was particularly ecstatic because I said it was okay to have sandwiches for dinner…. The Viennese have a long history and tradition in bread baking, just think of that famous Kaiser rolls… so one of the oldest bread recipes known in Vienna is the Vienna bread (a dough you can easily make Kaiser rolls from as well) […] In the 19th century, for the first time, bread was made only from beer yeast and new dough […] The first noted or applauded example of this was the sweet-fermented Imperial “Kaiser-Semmel” roll of the Vienna bakery at the Paris Exposition of 1867. These sweet-fermented rolls lacked the acid sourness typical of lactobacillus, and were said to be popular and in high demand. Happily, Astrid didn’t make us use beer yeast to make the bread and offered a recipe calling for regular yeast. You’ll want to bake along and receive a Baking Buddy Badge to display on your site; bake Vienna bread and post about it (we love to see how your bread turned out AND hear what you think about it) before the 29 August 2011. If you don’t have a blog, no problem; we still want to see and hear about your bread!! Natashya, Living In The Kitchen With Puppies: The Bread Baking Babes make Kaisers! As I was writing this post, I was very curious to see if egg is traditionally used in Vienna Bread and/or Kaiser rolls. I googled and found several recipes for Vienna Bread that called for flour, water, salt, yeast and milk – no egg. Of course there were also several online Vienna bread recipes that called for eggs. Then I looked in all of my bread cookbooks – rather a lot – and only one of the books mentions Vienna Bread and Kaiser Rolls at all. Nowhere was fine, white bread more greatly prized than in Vienna where, at the World’s Fair of 1873, the roller-milled flour of Hungary was leavened with a “secret” yeast called Marxner Pressheffe to produce the famous Kaiser Semmel bread, a name which sounds like the title of a waltz by Strauss. The Viennese established a reputation for excellence unsuprassed to this day, the apogee of the baker’s art. I confess that I’ve never made any of the recipes in this particular book. My snot-nosed reason is that it calls for “packages” of yeast. Sheesh!! Exactly how much is in a standard package of yeast purchased in UK??! In the book, there is even a page of conversion tables with oven temperatures in F, C and Gas Mark; weights and measures (pan sizes, cups, spoons, grams, etc) but NO mention of various kinds of yeast, let alone how much dry yeast is in a package…. Also omitted is an explanation of Marxner Pressheffe. Perhaps it was still a secret when this book was published in 1975. The yeast is a Viennese specialty, known as the “St. Marxner Press-heffe,” and its composition is a secret It keeps two days in summer and a little longer in winter. bread-flour in the world, […] at Vienna the wheaten bread, especially the Kaiser semmel, which is what we should term a dinner roll or manchet, is simply perfection. The excellence of the Viennese bread is said to be owing to the bakers, the ovens, and the yeast. […] The yeast is a Viennese speciality, known as St. Marxner Pressheffe, and its composition is a secret. It keeps two days in summer and a little longer in winter. edit 23 August 2011: To bake bread and pizza on the barbecue, we use one of those inexpensive (around $10) pizza stones available in most kitchen stores. The advantage to this sort of stone is that it’s lighter weight than the stone we have for the oven. Because of hot spots in the barbecue, we move the stone back and forth from direct to indirect heat to prevent (for the most part) burning on the bottom. When I shape buns for baking on the barbecue, I place them on parchment paper and cut the paper so that each roll is on its on piece of paper. Before the crust has set so it’s not so easily pierced and dented, it’s easier to turn the bread around by grabbing a corner of the paper than to turn the bread with tongs. And there is a lot of turning that is required – there are LOTS of hot spots on our barbecue…. This entry was posted in baking, BBBabes, bread - yeasted & unyeasted, bread recipe, food & drink, posts with recipes, PPN; YeastSpotting, MLLA, Bookmarks; T&C on Tuesday, 16 August 2011 by ejm. Yes! Oh how I would love your sandwich! Looks marvelous! Alas, my grill baking isn’t taking off. We do use the grill lots now but mostly veggies and some meat. The rest of the day is taken up with unpacking, organizing, cleaning up from construction this winter and things like today = we’re making a temporary kitchen counter 8ft. We loved the Kaisers too! I can’t be bothered with the windowpane either, but I do like the lightly oiled bowl. I seem to use less flour and get a better crumb with that method. Buns on the grill – great idea! And that sammie sounds divine. I am with Natashya: windowpane: pha! but I do like what a little (!) as in some drops of oil do to most of my doughs and the crust afterwards. Just like bread baking is: everyone is welcomed to do like it pleases him or her. as for the egg in Vienna bread or Kaiser Rolls: Honestly I do not care what the internet says or not. What I know is that the recipe of Peter Reinhard i pretty close to how we make this bread and rolls here in Vienna. I should know ’cause one of my former boyfriends was a baker by profession and believe me I spent many o nights in the bakery downstairs to make bread dough and all sorts of rolls with him. I am glad you loved the challenge and the bread – though with all your changes – technically you would not call that a Vienna bread or typical Kaiser roll anymore. – Hope yu don’t mind that a bit snarky rant of mine, Babe! The sandwich really was delicious, Tanna. The following night we grilled pork with the BEST bbq sauce and for a picnic lunch yesterday, we had thinly sliced pork with bbq sauce and julienned red pepper and lettuce sandwiches on the rest of the Kaiser rolls. Those sandwiches were also very very delicious. I’m always so relieved to hear that others don’t bother with windowpane testing, Natashya. I’ve only once lightly oiled the bowl and then I forgot to oil the bowl – very early on in my breadmaking career – I’ve found that the dough just pulls away all on it’s own, leaving nothing behind on the edge of the bowl. Yay, Astrid!! Another anti-windowpane tester! I really should have asked you earlier about the texture of Viennese bread – what with you actually living in Vienna! Clearly, the Kaiser rolls I’ve had in the past are ersatz Kaiser rolls (and they were white flour ones). We really loved the rolls we made using the recipe you gave us though. One of these days, when I’m not on my “must have wholegrains in everything” kick, I’ll make them using only white flour…. There is no shame in not baking bread on the barbecue, Kate. I haven’t really done it either – my husband is in complete charge of the barbecue. (I don’t even know how to turn the stupid thing on.) As for pizza on the barbecue, I highly recommend getting one of those inexpensive round stones – about $10 from a kitchen supply store. They are GREAT for making pizza on the barbecue. The boule turned out surprisingly well inside. We sliced it and grilled it with a little olive oil drizzled over. It was pretty fabulous! OK, fine, be that way, Babes! I ALWAYS do the windowpane, and I’m not ashamed to admit it! And I oil the bowl. I haven’t ever baked on the grill, though, and this I would very much like to learn to do. Elizabeth, do you have a special stone for your barbecue, or is it the same one that you use in the oven? To bake bread on the bbq, we use one of those inexpensive (around $10) pizza stones available at most kitchen supply stores… the stone fits perfectly on the bottom shelf of our barbecue. Rofl! (I do love an enriched dough…) Awesome that you can make it work in the BBQ. Ours has two temperatures. Hot and Hades. It would definitely be a challenge to bake in it. finally I’m taking a tour to visit the Vienna bread. Wow your rolls looks perfectly folded, very nice. Window paning? Me neither, you can feel if it’s elastic or not without all that fuss. I find bread is much forgiving than people/bakers are making us believe. I never baked bread on a BBQ, very brave to experiment with it!